An article about a trade in the NBA. ESPN's ?Adrian Wojarowski is reporting that the Charlotte Hornets have traded eight-time NBA All-Star, Dwight Howard to the Brooklyn Nets in exchange for Timofey Mozgov and two second round picks in tomorrow's draft. Howard scored an average of 4.2 points per game last season. 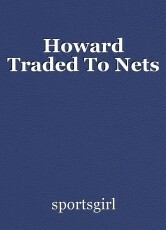 Word has it that the Hornets wanted to move Howard because of his $23.8 million expiring contract. Mozgov has two years and $32.7 milion on his contract. This is the third time in three years that Howard has been traded. Howard has also played with the Houston Rockets and the Atlanta Hawks. do sporting rituals effect practical performence?